Matrix7 offers leading IT support in Canberra and can configure and install both small and large scale wireless networks using the latest Ubiquiti devices, Access Points, Routers and Switches. By using Ubiquiti's vast array of solutions we can provide tailored customisation and virtually unlimited scalability. From the most complex of applications down to small office implementations, security is paramount in our design. We pride ourselves on our post implementation support to give you piece of mind when choosing a provider. UniFi is a revolutionary Wi-Fi system that combines enterprise performance, unlimited scalability, and a central management controller. The UniFi AC Mesh APs have a refined industrial design and can be easily installed using the included mounting hardware for both the indoor and outdoor units. The system can be managed through any standard web browser. The UniFi Controller software is a powerful software engine ideal for high-density client deployments requiring low latency and high up-time performance. Once implemented, the UniFi Controller software can be used to quickly configure and administer an enterprise Wi-Fi network. Monitor performance, real-time status, automatic UAP device detection and advanced security options are all seamlessly integrated. As you can see all the various sites can be managed by us from a central location. We can also setup multiple tenancies within each location to give you the ultimate flexibility. 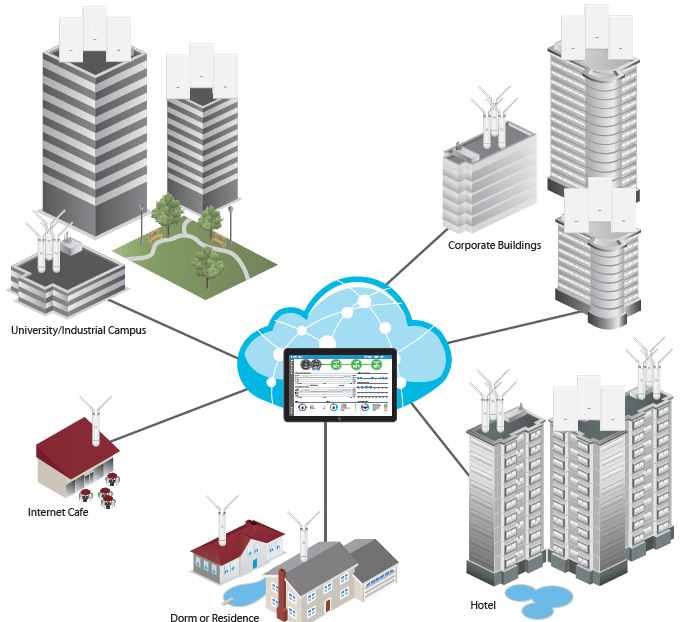 A large outdoor area, such as a park with minimal infrastructure or expansive spaces between buildings, can take advantage of a mesh network comprised of the UniFi AC Mesh model. Basically, users can roam freely around the large outdoor space and be seamlessly connected to your network. They stay connected as they roam without the need to continually re-connect when they exhaust the connectivity of the Access Point they're currently connected. They're automatically "migrated" to the next node they're closest to and to them the connection is seamless. This is a fantastic solution for businesses that make use of roaming staff with iPads, Laptops and any other device that requires a wireless network to connect to the internet or your internal network. Truly cool! This is also great for Guest network access when you give your clients access to your Guest wireless network and they move around your building or facility. Once again, constant connectivity.